Fly fishing is at the center of JT Van Zandt's life. 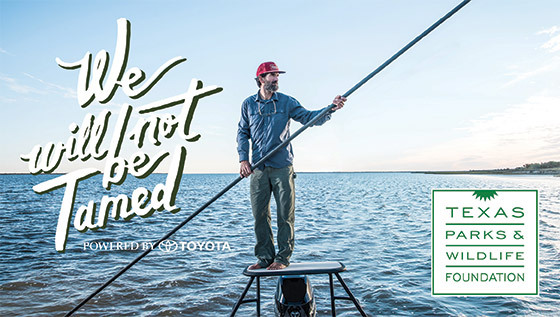 He’s been fly fishing the coastal waters of Texas since 1991. The oldest son of the late singer-songwriter Townes Van Zandt, JT honors his father’s spirit by finding and protecting harmony in nature. As a longtime fly-fishing guide who specializes in red fishing on the Texas coast, JT is dedicated to protecting natural resources so that his children can experience the same magic he did as a young man. That’s why JT is an ambassador for Texas Parks and Wildlife Foundation’s We Will Not Be Tamed campaign. The campaign encourages all Texans to get involved in conserving the wild things and wild places of our state. For JT, it’s important to share his love for fly fishing with others, especially young people. A Texas Monthly video crew joined him on a recent fishing trip. JT Van Zandt encourages all Texans to get more involved in conservation. One way to do that is by joining Texas Parks and Wildlife Foundation as a member. Thanks to TPWF members, coastal treasures like Powderhorn Ranch will be enjoyed for generations to come. 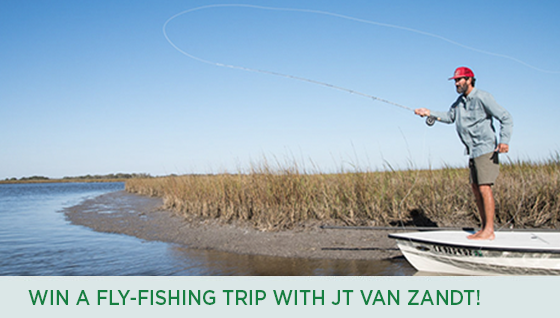 Join now for a chance to win a fly rod and reel from Sportsman’s Finest and a fishing trip with JT Van Zandt! *The price of membership pays for TPWF membership only and not for the chance to win the fly-fishing equipment and the trip with JT Van Zandt. Members who join by August 31 are automatically entered in the drawing. 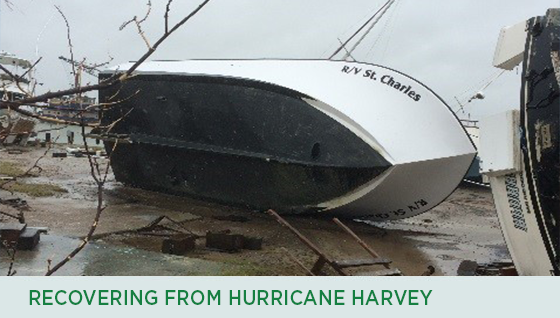 From Rockport to Jasper, Texas Parks and Wildlife Department (TPWD) sites, facilities and equipment suffered significant losses from Hurricane Harvey. Damages to TPWD’s Coastal Fisheries Division facilities alone totaled more than $1.5 million. Most of the repairs weren’t eligible for insurance or FEMA reimbursement, and there are many competing priorities for limited state dollars. With that in mind, Texas Parks and Wildlife Commission Chairman Emeritus Lee Bass pledged $500,000 for a private fundraising effort for Coastal Fisheries Division losses, and many other generous foundations and individuals also pitched in. Thanks to these gifts, $1.5 million was raised and is being deployed for repairs up and down the coast. One of two critically important research vessels that were damaged is already back in the water, and the second one is now being repaired. Facility repairs are underway, and the Dickinson Marine Lab reconstruction is expected to be completed by the end of 2018. Many other repair projects are also in progress. Another Hurricane Harvey casualty was the Fulton fishing pier in Aransas County. Beloved by tourists and locals alike, the pier is a significant community asset for the Coastal Bend region. Structural damage from Hurricane Harvey rendered the pier unusable, as entire sections of the pier washed away and many support pilings were compromised or destroyed. The town of Fulton is dealing with many other storm-related recovery efforts, so TPWF is stepping in to help. 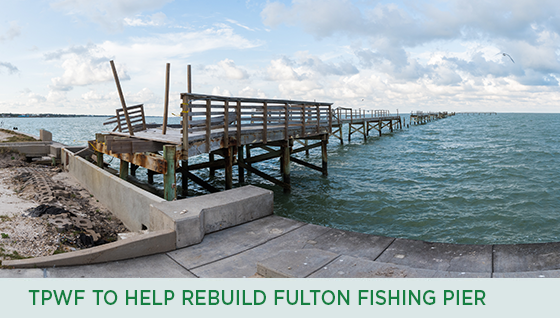 TPWF is now raising funds to repair the pier and will manage the reconstruction project so the pier can reopen as quickly as possible. YETI and the Sid W. Richardson Foundation have made generous donations to help rebuild the pier.